I have not posted in a while since I was moving to another city, sorry for the long time I was silent. Having moved to another place brought the opportunity to realise a solution I was longing for a long time now – a dedicated piece of furniture to store my photo gear. I browsed the web for solutions and found many. Some people keep their stuff in bags, some in shelfes, some on drawers. 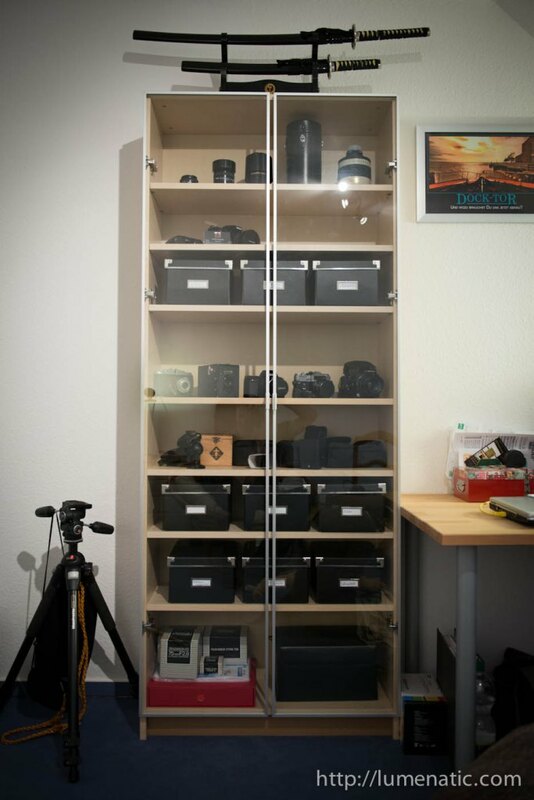 Today I want to present what solution for storing my photo gear I chose. Proudly I want to mention that it was a gift from my wife – I was yacking so long for a photo gear shelf that she gave me a gift voucher so that I could finally go and buy my photo shelf. The solution I chose turned out to be an Ikea Billy bookshelf (202x80x28 cm) with two glass doors in an aluminum frame (Morebo). I had two requirements which the storage solution should fulfill. Firstly, the lenses and cameras should be presented nicely (=glass doors). Secondly, the accessories and “small stuff” should be hidden from view. I looked at many cabinets with glass doors in the upper half and drawers or non-transparent doors in the bottom half. But somehow this never appealed to me, just did not look right. Be sure to bolt the shelf to the wall ! The doors are comparatively heavy and when the self is empty with the doors open the complete piece of furniture will tip over ! I learned that the hard way, but was able to prevent a catastrophe. The shelf now holds all photo gear (excluding the large stuff like tripod, light stands, backdrop frame, backdrop cloth). I like it very much because you have everything sorted for quick access. The boxes I use more frequently are on a higher shelf board for easier handling (cables, chargers, batteries, memory cards). The stuff I do not need to access so often is at the bottom (manuals, negatives, film material, GPS unit etc.). 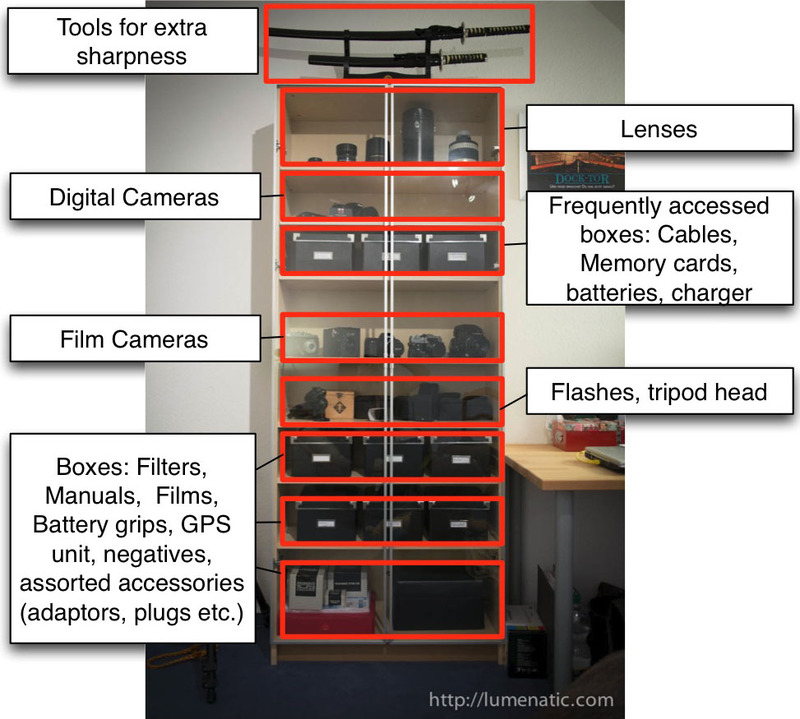 This is one of many possible ways to store your photo gear. I would love to learn about your gear storage solution. Feel free to drop me a line or you can create a guest post presenting your way of storing your stuff.